Don't Let the Wrong Words Trip You Up! Your Ultimate Source for Choosing the Perfect Word When It Really Matters! Get Word Tripper of the Week for 52 weeks plus valuable bonuses on better writing. Sharpen your language skills every week with Word Tripper of the Week and interactive writing bonuses! This innovative email subscription program is for authors, admin assistants, business professionals, court reporters, English language students–anyone who writes. Consider Bulk Sales and/or Licensing. Request a follow-up call. Who benefits from using Word Trippers and Word Trippers Tips? “Eager” means exciting or enthusiastic; “anxious” means full of anxiety or worry. The verb “lose” is the opposite of the verb “win.” “Do you win or lose when you gamble?” The adjective “loose” means not fastened tightly while the verb “loose” means to free something. Barbara’s Word Trippers material should be in everyone’s back pocket. It is a quintessential reference for those words that can stump us with their appropriate use. I’m a bit of a word nut and I learned a few things. Highly recommended. Hardly a day or week goes by that I don’t use Word Trippers. Barbara has made it easy to find the right word for the right content! Barbara McNichol has gathered all those tricky words, so easily confused—bring/take, then/than, lay/lie—to assist in using the correct word. Authors as well as teachers of English, creative writing, and journalism would do well to keep Word Trippers within reach of their computers at all times. You don’t want to embarrass yourself in print. But figuring out the differences can be time-consuming and sometimes confusing. You’ll find clear explanations for commonly confused word pairs. That makes it quick and easy to select the option that applies and then get back to the task at hand. 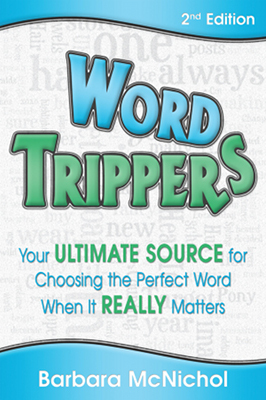 Word Trippers gives you an easy-to-search tripper-tracking source for selecting the perfect word when it matters most. A considerable work; this is a good collection with clear explanations. If you know someone who is a writer, or if you have loved ones going off to college, this would make a great gift for them. When they get stuck while writing, uncertain about the correct word (is it “affect” or “effect”? ), they’’ll have the answer in their inbox or at their fingertips. As a professional writer, I enjoy the twists of the English language, such as when to use peek or peak, and course or coarse. Like big rocks on a path, I trip over how to use ‘lay vs. lie’ and ‘compose vs. comprise.’ That’s when I peek at Barbara’s Word Trippers and get back on course. From writing I encountered in the business world, I think everyone from administrative assistants to managers and CEOs would benefit from Word Trippers. Gremlins can sneak in anywhere!